The triceps muscle of the upper arm (technically known as the triceps brachii) has 3 components, or heads, that in total make up the muscle. The triceps begins at the shoulder, extends down the back of the arm, crosses the elbow joint, and attaches onto the upper portion of the forearm (at the ulna bone). At each end of the muscle is the triceps tendon, which attaches the muscle to the ulna bone of the forearm. Avulsion or rupture of the triceps tendon most often occurs after trauma. Indirect trauma is the most common cause of injury and usually involves a fall onto an outstretched arm, with resultant pain about the elbow. This mechanism places a deceleration stress on a contracted triceps muscle, with or without a concomitant blow to the posterior aspect of the elbow. 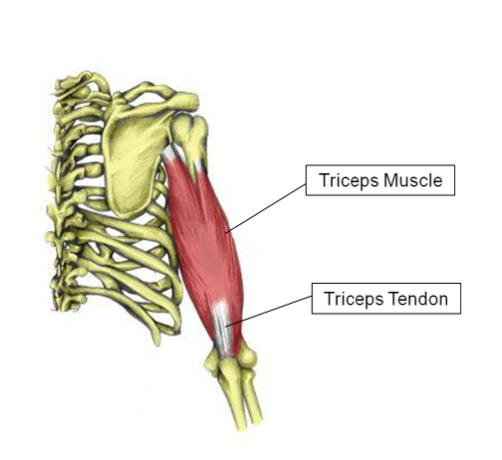 Injuries to the triceps tendon are most common in males, especially over the age of 35. 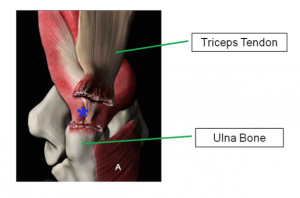 Triceps tendon tears can be either partial or complete. Partial tears are rare and occur when a portion of the tendon remains intact, but a portion of the tendon tears away from the bone. More commonly the entire tendon tears, or ruptures, and pulls away from the ulna bone (see picture below where asterisk marks the site of the ruptured tendon). swelling, bruising, and deformity of the triceps muscle typically ensue in the days following the injury. Patients also report pain and weakness with attempted elbow extension and pushing activities. 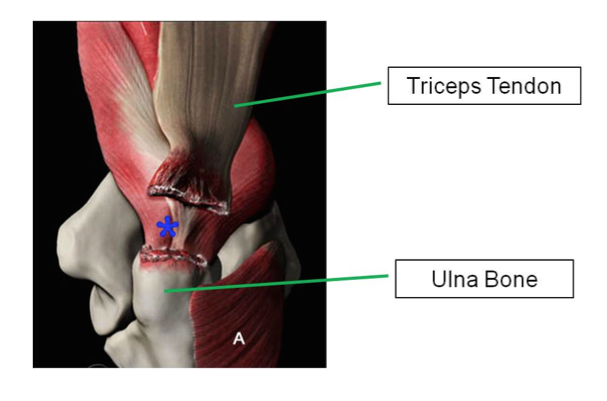 The diagnosis of a triceps tendon tear is typically made by a combination of the patient’s history and the findings on physical examination. X-rays are frequently obtained to rule out other injuries or look for a fragment of bone which may be pulled off when the triceps tendon tears. (see x-ray image below where the avulsed fragment of bone is enclosed within the green circle). 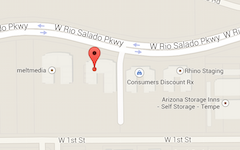 An MRI scan is used to confirm the diagnosis and determine whether the tear is a partial tear or a complete rupture. The treatment of triceps tendon ruptures depends upon the extent of the tendon injury (ie partial tear versus complete rupture). 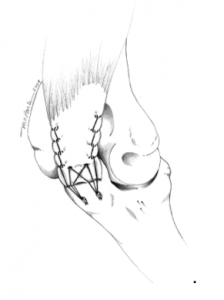 For patients with partial tears representing less than 50% of the tendon thickness, non-surgical treatment is typically recommended initially. Non-surgical treatment consists of icing, anti-inflammatory medications, bracing, activity modifications, physical therapy, PRP or stem cell injections, and a gradual return to activities as tolerated.